This Tutorial time about how to automatically redirect URLs that are opened with UC browser to Google Chrome. In this post, I will provide you with one of the best tips that all of you would love most. Because it is a completely unique content. Friends, if your website is Monetize. This means that the adsense are being Ads on your website. And you are earning through it. And everyone has a desire to earn more money. This is my wish too. Because I am also making money through my blog. But friends, you will not know if your site is not seen by anyone ads, then it will never be income. So some people in their browser Enables the adblock function in Because of which you can not earn much money. Its biggest reason is that UC browser. This article is the main TIPS to automatically redirect the UC TO chrome browser. So keep reading... Read properly in what is written in it And according to that, after watching it, I would say exactly what I said. 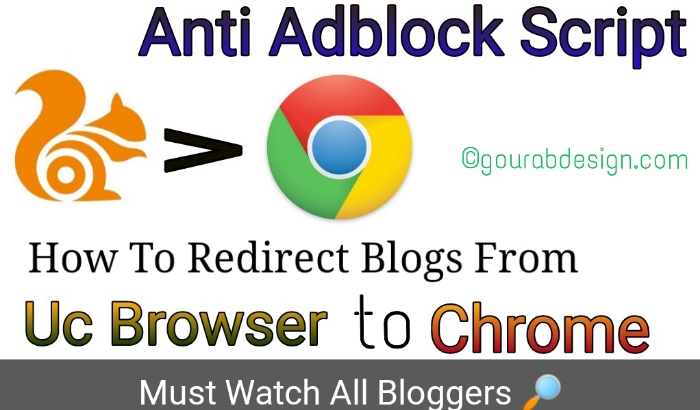 This method is a kind of anti adblock, but it is better than anti adblock. Users do not need to do anything, it will be immediately moved / transferred to the Google Chrome browser, if detected, open the URL of our blog / website with UC Browser. Curious how? Please follow the following method. Please log in to your blog's dashboard. Everything departs from injustice which leads to a decrease in the rating as a publisher, due to behavior and behavior of one of its features, AdBlock (AdBlock Plus). How not so annoying, as a publisher who has been fair in placing advertisements so as not to disturb the comfort of the readers, feels that he has been "beaten evenly" with publishers who are reluctant to give visitors space to read articles on their blogs, because they are crowded with ad slots. This should not continue to happen. Such equalization should not occur. If you want to be prejudiced, tools or extensions like AdBlock can be said to be a conspiracy model to impoverish publishers. Perhaps the visitors of your blog are more open using UC Browser, so you need to consider installing the anti-UC browser above. Then why would Google Chrome be the place to transfer? So far Google Chrome is one of the best browsers that still applies fairly to publishers. Also it looks friendly, aka light and easy to use. That's all, later if a lot is praised, whatever happens next. How do you like this post? Please share it in social media. So that everyone can get help.